Join us at Armitage Park on April 28th from 10-2pm for a Trout Spey tutorial. 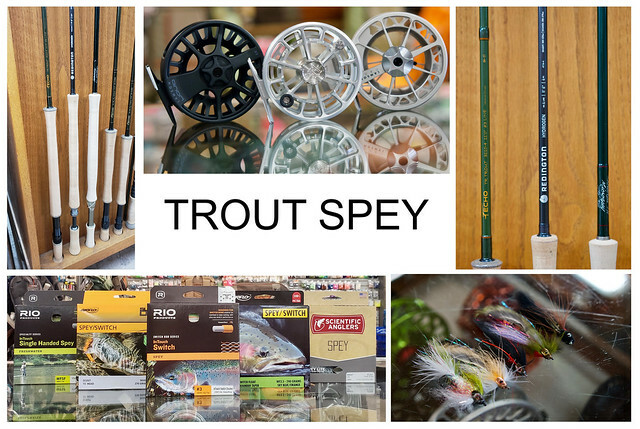 We will have spey guru’s George Cook and Eric Neufeld on hand to discuss and demonstrate in-depth, the what, why and how of fishing for trout with a two handed rod. At 10am George Cook will kick things off with a gear chat and by 11:30 he will be on the water demonstrating and instructing you while you demo rods from SAGE, Redington, Echo and Winston. We will have Eric Neufeld(Echo, Simms, Winston Sales Rep) on hand as well and no doubt Eric will have his take on the state of Trout Spey as well. This is a great opportunity to learn about the flies, lines, rods, tactics and much more related to “Trout Spey” fly fishing. George and Eric will have their full arsenals of “big boy” spey rods on hand as well so if you would like to cast any other of the two handers offered they will be available to demo. We are looking for 15-30 interested anglers for this free clinic please contact us at 541-342-7005 to sign up. This entry was posted in Classes and Instruction, Fly Fishing Gear Review, Oregon Fly Fishing Tips. Bookmark the permalink.